RT Social Media has won its first-ever Webby Award, after beating established rivals in the popular vote for the world’s most prestigious internet accolade. And it’s all thanks to you! After three weeks of online voting, RT scored a confident popular victory over BBC News, the New York Times, NBC News & Nightly News, and ABC News in the Social Media News & Information category. “To be nominated in the first place means we're doing things right. To win the People's Voice award – and to win it by a landslide – means our community is engaged and close to us. And we thank every person who voted and brought this victory!" said RT’s Head of Online Projects Kirill Karnovich-Valua. The prize from the judges went to the New York Times, which also captured the award for best news website. Notably, it was also beaten in the popular vote in that category – by Glenn Greenwald, Laura Poitras and Jeremy Scahill’s The Intercept, another relative newcomer. 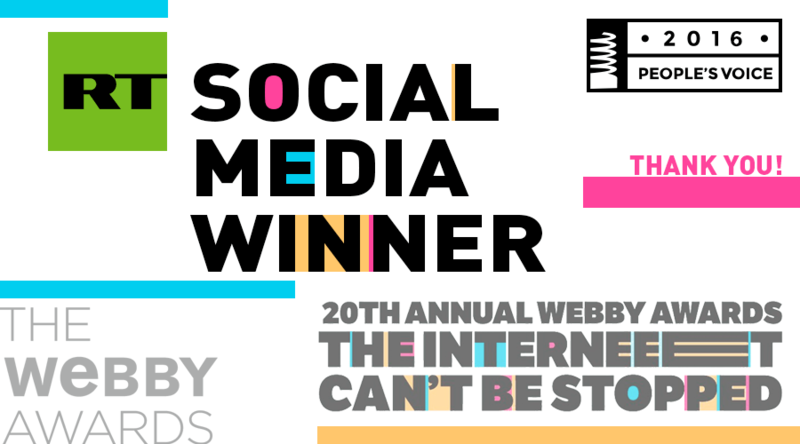 The Webby Awards are the most established internet awards ceremony, and RT’s online team will collect its prize at a star-studded gala in New York next month, for a 20th anniversary edition of the event. "We have an incredibly talented social media team which gets the full credit for the victory. Our team is multi-task – social media is their environment. The guys are as comfortable with Twitter or YouTube as they are with 360 vids, GIFs, VR and many other trends and formats. Now RT's social media strategy is recognized on the very top Webby level. So, hats off to the team," said Ivor Crotty, RT’s Head of Social Media. RT Social Media has celebrated a year of technological progress. The channel has become one of the first major media outlets to regularly broadcast using Periscope and Facebook Live, both to cover news stories, such as the continuing conflict in Syria, and to give audiences a behind-the-scenes peek at our studios around the world. We have launched RT 360, a dedicated channel that broadcasts spectacular panoramic videos, and the innovative Ruptly Stringer app, which takes citizen journalism to another level. RT broadcasts in six languages, and has over 3.5 billion views on YouTube, more than 13 million Facebook fans, 6 million Twitter followers, and a live audience of millions around the globe.